Work Hard. Player Harder. External GPU to Go! Gaming or graphics processing on a thin/light notebook? Even when equipped with a beautiful display and a high-performance CPU, you probably wouldn’t have thought of loading games onto one (unless you like playing at low frame rates, resolutions, and detail settings). With the development of Thunderbolt 3 connected external GPUs, such as Sonnet’s eGFX Breakaway Box, desktop boxes that support a range of desktop GPU cards that can boost your computer’s graphics performance are now available, making Ultrabook™ gaming and video editing a reality. But, they are, at best, transportable. What if you could instantly boost your computer’s graphics performance anytime and anywhere you need it, without being anchored to a desk? Here’s an idea—Pack a Puck! 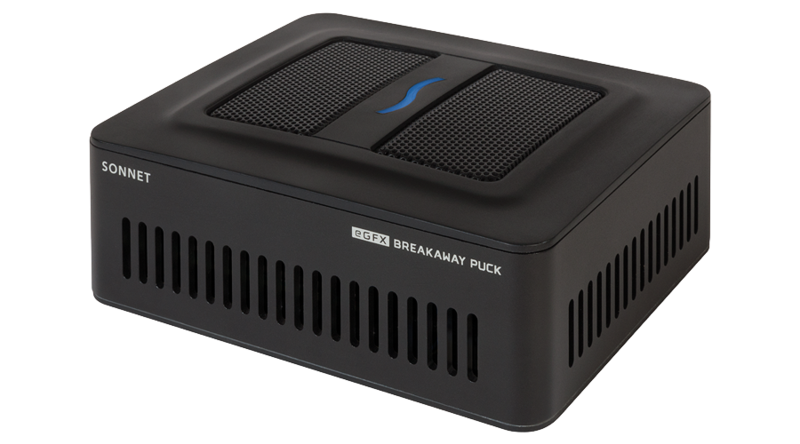 The eGFX Breakaway Puck conveniently packs with your notebook in a backpack or computer bag when you need GPU acceleration while on the road.